The most common horse ailments are colic, heaves, laminitis (founder), abscesses, and "tying up". Two common horse diseases are EPM and "Moon Blindness". Here's how to recognize and treat them. Colic is a digestive problem that commonly afflicts horses. Although it's common, that doesn't mean it isn't serious. It can be. Horses digestive systems are designed to work only in one direction--from mouth to colon. Horses cannot throw up. If they do, their stomachs rupture, which is fatal. If their intestine become twisted (torsion), it can be fatal. What causes colic? That is the question. Rapid changes in diet, intestinal parasites, and too much grain combined with too little forage (hay) in the diet can cause a horse to colic. To prevent colic, make any changes in your horse's diet gradually, deworm him as recommended by the American Association of Equine Practitioners, make hay the foundation of his diet, and make sure he gets plenty of time outdoors to move around. Signs of colic: Refusing to eat, pawing the ground, infrequent bowel movements or straining to have a bowel movement, teeth clenching and excessive salivation. If you suspect your horse is experiencing colic, do NOT allow him to lie down and roll. This could cause a torsion. Instead, call you vet immediately. This very brief video shows the many signs of colic in horses. Treatment: Leave this one up to the vets. But one way to help prevent colic is to feed your horse a healthy diet and NEVER grain your horse before riding. Horses who graze in sandy soil areas may benefit from psyllium, a non-digestible fiber that clears matter from the intestine. (See recommended products below.) I personally also recommend SmartDigest (which I buy through SmartPakEquine). It provides prebiotics, probiotics, yeast, and enzymes that have been clinically proven to benefit equine digestion and help prevent colic. According to the SmartPakEquine website, if you order in it through them, you may be eligible for $7,500 of colic surgery reimbursement through their ColiCare program. “Heaves” is a disease of the respiratory system that is characterized by chronic inflammation. It is thought to be caused by an allergic reaction to airborne particles. The usual causes of heaves are mold and dust in poorly ventilated barns. Heaves can be treated with medication, but unless these causes are eliminated, the effectiveness of medication will be limited. Founder is a painful condition in the tissues (laminae) that bond the hoof wall to coffin bone become inflamed. It is usually caused by too much grain or alfalfa in the horse's diet. The horse will appear lame, and the affected hoof (or hooves) will fell hot to the touch. Prevention is the best course of action. Make sure your horse's grain is locked tight in a container that is bug-proof and cannot be opened by a horse fiddling with the latch or cord that seals the feed bin. Horses can be very clever with their teeth and lips, so a padlock, chain, heavy-duty bungee cords that must be stretched and unhooked to remove, or a locked storage closet are the best ways to store grain. Another risk is too much alfalfa in the horse's grazing pasture. This can be fatal. 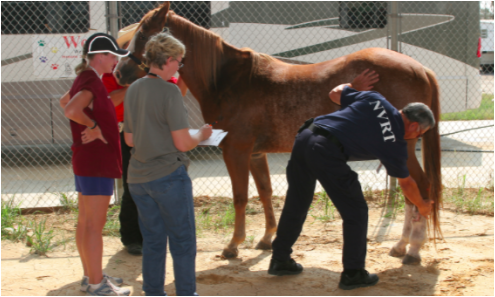 Treatment is usually cold water hosing, cold packs, anti-inflammatory drugs, and corrective shoeing. Here is an excellent video that describes each. An abscess is an infected pocket within a bodily cavity. The most common location for an abscess in horses is the hooves, but they can also occur in other places on the horse's body following injuries. The affect area will feel hot to the touch, and will be very tender. Treatment involves soaking the hoof, wrapping it in a poultice that draws out the inflammatory fluid, draining the abscess, or (in severe cases) cutting out the infected tissue and administering antibiotics. Here is an excellent brief video from SmartPak Equine on recognizing and treating abscesses in horse hooves. Parasites are usually worms, ticks, or protozoa that become embedded in a horse's skin, lungs, heart, or intestines. For more about how to prevent or treat parasite infections, click here. A horse that is “tying up” is a horse that is experiencing severe breakdown of muscle tissue. The veterinary terms for this condition is exertion rhabdomyolysis, or azoturia. It is usually caused by over-exertion (over working the horse), but it can also result from mineral imbalances in a horse's diet. ​A horse that is tying up will move stiffly, have a sore back and/or hindquarters, appear to be suffering muscle cramps, and will be reluctant to move. These signs are very similar to those of colic, so it is important to get help from an equine professional rather than guessing. Ways to prevent tying up include avoiding over working your horse (particularly in the heat), providing electrolytes in your horse's water during hot, humid months, and putting a mineral block in her stall. Of particular importance is preventing tying up is ensuring that your horse has enough vitamin E and selenium in his diet. Some parts of the country have selenium-deficient soil, so horses that get most of their calories from pasture grazing may not be getting the daily intake of selenium that they need to stay healthy. Here is an excellent video by Sarah Hyder in which she discusses colic, abscesses, and founder--how to tell if your horse is suffering any of these and what to do about it. Two other horse diseases worth mentioning are Equine Protozoal Myeloencephalitis (EPM) and Equine Recurring Uveitis (Moon Blindness). ​EPM is prevalent in some parts of the country. It is a wasting, neurological illness that can spread through a barn when horses ingest a tiny organism while feeding or grazing. The good news is that there is a protocol that is extremely effective in treating this disease. According to the American Association of Equine Practitioners, 60 to 70 percent of EPM cases treated show significant or complete reversal of symptoms, and many are able to return to normal activity. More about EPM. Moon Blindness is a common eye diseases in horses, and the leading cause of equine blindness. One or both of the horse's eyes will show tearing, redness, cloudiness, swelling, and light sensitivity. It is called "moon blindness" because, like the moon, it manifests in phases--bouts of inflammation followed by periods of inactivity. More about moon blindness here.